I am so excited to have been introduced to GoNoodle earlier this week. some new friends to join the fun! 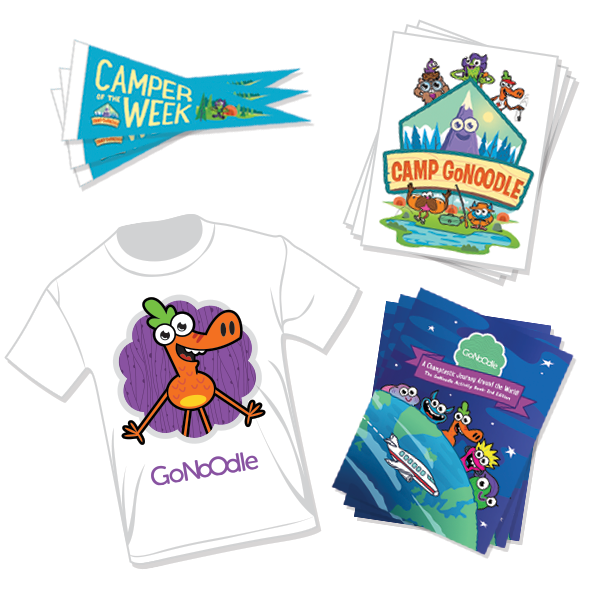 Camp GoNoodle is an extension of GoNoodle. If you already love GoNoodle for the classroom or at home with your children (or grandchildren!) , you’ll love Camp GoNoodle ! Get ready for the excitement. Go on adventures! 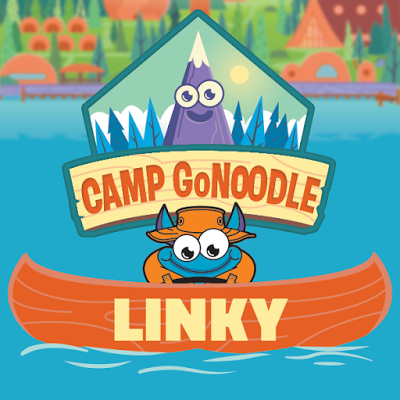 Each adventure uses GoNoodle.com’s active videos and games for inspiration, and challenges kids to use their imaginations, get moving, and be outside. Can you imagine building your own DIY jetpack, creating an obstacle course race, or making sushi with things you already have at home? Sing along! Each week includes two new camp songs to inspire creativity and movement. 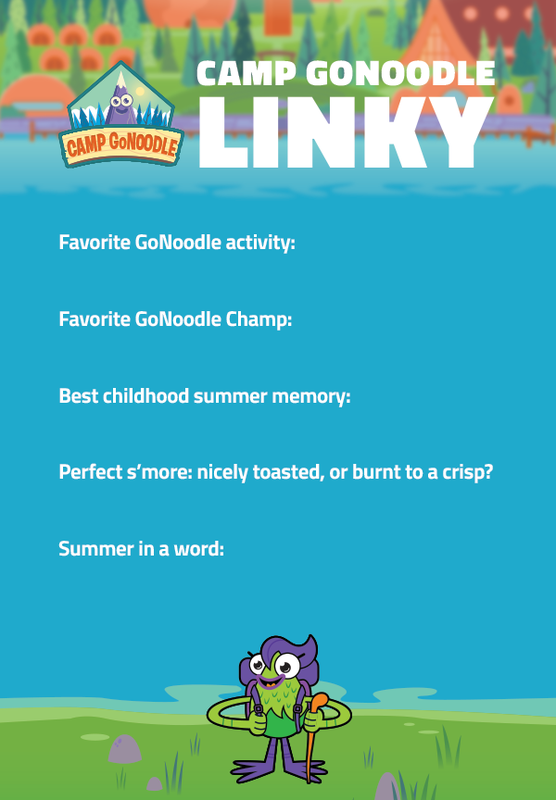 Share your adventures using the #campgonoodle hashtag to join the camp community. 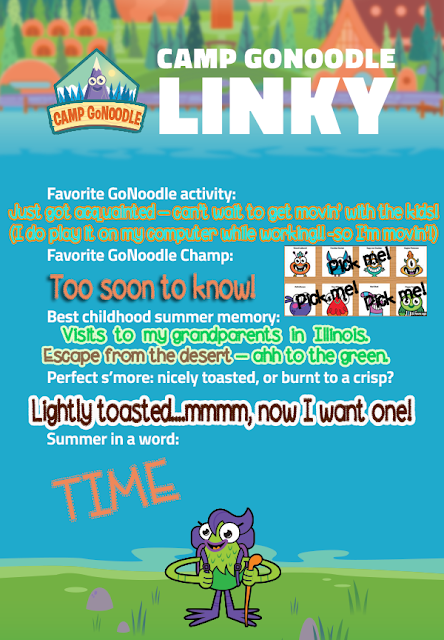 Each week, Campers of the Week are recognized as all-stars and earn exclusive Camp GoNoodle prizes. Earn badges! Complete each week of adventure by printing the weekly badge to hang up, loud and proud. There will be 4 weeks of camp...each having a different theme! and kids who want to have fun. *Important, as newsletter will only be sent to parents. 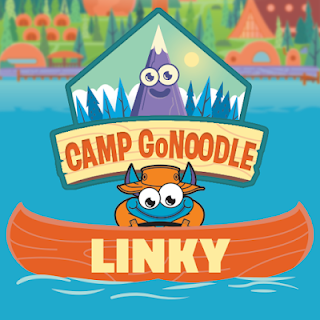 Join our Camp GoNoodle Linky Party! Use a program (like PPT or Photoshop), to fill in the linky image, answering all of the questions. Write a blog post about Camp GoNoodle and use the images in your post - encourage other bloggers to come link up too!! Look at the fabulous prizes! GoNoodle is going to use a random number generator to choose a winner from all of the teacher bloggers that link up. is the place to go! 4. Come back here and link up with me! Click on the link to see who's joined me. Your blog ROCKS! :) Thanks for linking up! Loved reading about all your FAVs! If you haven't done "Pop-See-Ko" yet....you MUST! You'll never get the tune outta your head! Thanks Holly -- my header and nav bar disappeared last night, so I hope I can that fixed!. I'm so glad to have a friend stop by -I'm new at the blogging, but making progress -learning SO MUCH. :-) Yes, I keep hearing the name Pop-See-Ko, -- on the top of my list -- (I know about those tunes in your head!) Come back!